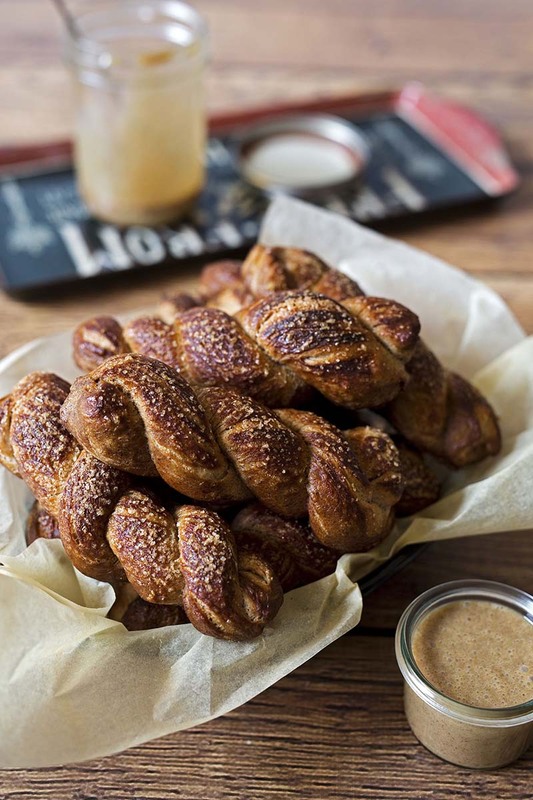 Sweet Cinnamon Pretzel Twists made with a cinnamon pretzel dough, shaped into fun-to-eat twists, then sprinkled with coarse sugar before baking to a deep golden brown. In the bowl of a stand mixer, using the paddle attachment, combine 2 cups flour, sugar, cinnamon, yeast, and salt. In saucepan or microwave safe dish, heat water and oil until warm (120-130°F). Add liquids to flour mixture. Blend at low speed until moistened. Beat 4 minutes at medium speed. Switch to the dough hook and mix in the remaining flour a little at a time, to make a soft dough, add more or less flour as needed. Knead the dough for 5 minutes until smooth and elastic. Place dough in lightly oiled bowl and turn to grease top. Cover; let rise in warm place until double, about 30 minutes. Preheat oven to 450°F. In a 3-quart saucepan, bring 8 cups water and ⅓ cup baking soda to a simmer. Turn dough onto lightly floured surface; punch down to remove air bubbles. Divide dough into 6 pieces. Roll into 20-inch ropes. Cut each rope in to 2 pieces - now you’ll have 12 pieces. Roll each piece into a 20-inch rope, cut the rope in half and twist the two pieces together and pinch the ends together. Add twist to the simmering water and cook 10 seconds on each side. Remove with slotted spoon. Place on greased or silicone mat lined cookie sheet. Repeat with remaining dough. Beat egg in a small bowl with 1 teaspoon water. Brush the egg wash over the tops of the pretzel twists. Sprinkle a thin layer of coarse sugar on top. Bake for 10 minutes until deep golden brown. Serve warm with cinnamon dulce de leche dip (optional).